Electronics with basic components is very important for the beginners. 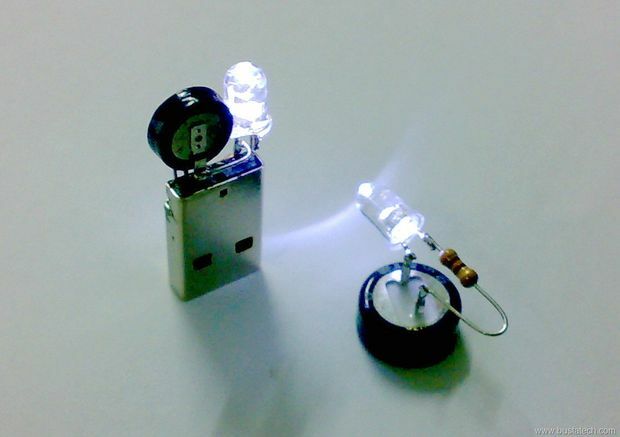 Here is the Most Simple Capacitor Circuit With One LED, One Capacitor and DC Power Source. It is so simple that a kid can do it. No wire or breadboard needed for this DIY electronics work. A capacitor is characterized by its capacitance. Capacitance is is the ratio of the electric charge (Q) on each conductor to the potential difference (V) between them. The SI unit of capacitance is the farad (F), which is equal to one coulomb per volt (1 C/V). We are demonstrating the one basic usage of capacitor. There are many types of capacitors, we will use the commonly seen aluminum electrolytic capacitors. Capacitor after charging once can hold some electricity after disconnecting. As we said before, having a basic electronics kit is good idea. In the hydraulic analogy, analogous to water flowing through a pipe, electrons will flow and capacitor will work like a rubber membrane sealed inside a pipe. Water drops will fall after we stop the water flow! We need a 470uF 25V capacitor, a colorless blue LED, a 5.5 DC volt power supply. µF is Microfarad, 1µF is 0.000001 F.
We talked about Breadboard Power Supply before. Battery will also work fine for this project. Do you know what is super capacitor? We talked about Carbon aerogel. Their capacitance values are much higher but has lower voltage limits. Long legs are positive poles. We passed the LED’s legs in between the legs of capacitor, so that positive-positive legs, negative-negative legs of capacitor and LED snugly fits. We do not say “positive” and “negative” poles for these electronic components, but cathode and anode. As younger peoples may read, we avoided too many terminologies. It does not need much explanation on how to do this easy thing. When we applied charge, i.e. connected the legs of capacitor (positive should touch the positive pole, while negative should touch the negative pole). When we connected the poles with power supply, the LED show a bright grow. Then we disconnected the system from the power supply. The LED dimmed but remained glowing for a time. This Article Has Been Shared 627 Times! Persistence of vision in DIY Electronics is Used To Create Beautiful Animated Texts, 3D Objects, Basic Line Drawings, Clock With Simple LEDs. BBC Micro Bit is an Embedded System For Coding in UK Like We Did on BBC Microcomputers. Let Us Look at the Official Specs & Schematic. Here is a Guide For Getting Started With DIY Electronics With Low Budget. We Discussed About the Components Needed For Electronics DIY Works. Reduce the Resource Consumption of Server how to guide is good for both data center owners as well as anyone who have Cloud based Virtual Dedicated Server. Arduino is a platform for prototype electronics free hardware development, it is designed with a microcontroller on single board supporting input / output. Cite this article as: Abhishek Ghosh, "Simple Capacitor Circuit With One LED," in The Customize Windows, April 3, 2016, April 21, 2019, https://thecustomizewindows.com/2016/04/simple-capacitor-circuit-with-one-led/.